Plain Sev or Ompudi or omapodi is very easy and addictive snack and is commonly used in Indian Chaats like Sev Puri, Masala Puri Bhel puri… For the flavor and digestion the Omkaalu or ajwain is used in this recipe. 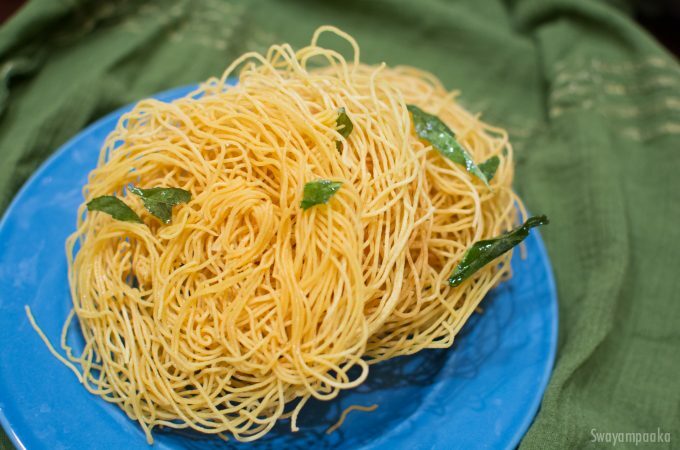 If you don’t like the ajwain, you can skip the same and prepare plain sev. This sev is not only for chaats, you can just eat it with Chai or Coffee or keep it in a bowl next to you and crunch it as you work. This truly happens in my home. My daughter loves to keep a bowl of this sev when she does her homework :) All this salty, crispy, crunchy snacks like chakli, kodbaLe, mixture …. are her companias during her homework sessions. Prepare this simple easy to make snack for Navarathri gombe bagina, as offering to Shri Krishna or for Deepavali as well. Peanut chikki – an addictive easy to make treat. Chikki is very popular, addictive sweet made of groundnuts / peanuts / Shenga and jaggery. 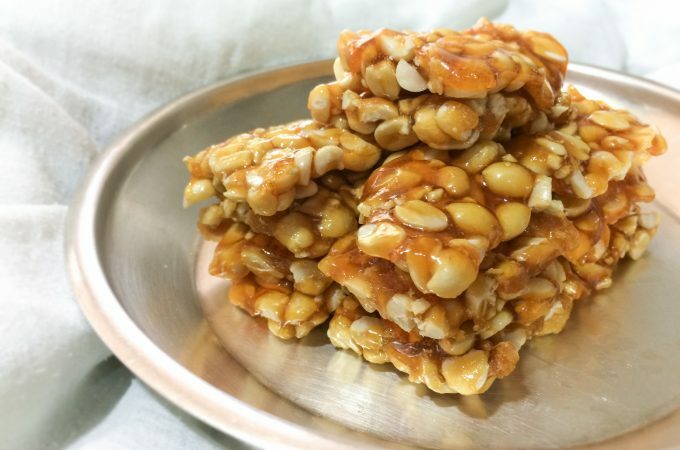 The important step in making this peanut brittle or chikki is the jaggery syrup consistency. This chikki can be prepared with combination of nuts, you can make til/sesame chikki too. 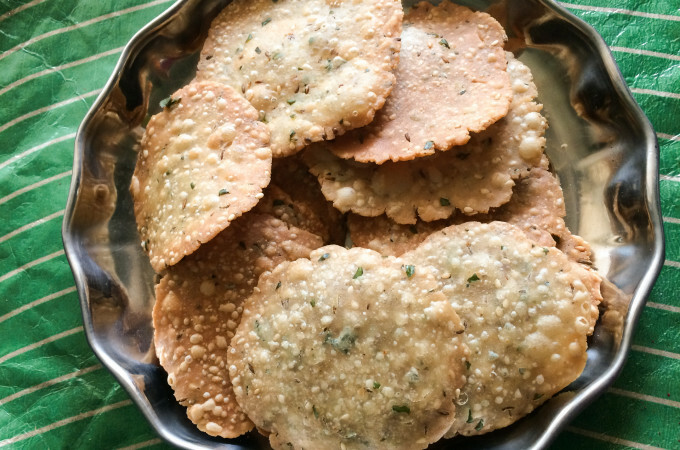 Rice Nippattu or Thatti is one of the easiest and tastiest snacks on earth. With only rice flour it is the best gluten free snack(skip asafetida for gluten free option).This is best and healthy alternative snack for the people with Wheat Allergies. The traditional Nippattu calls for the wheat flour and All-purpose flour. Best as travel snack and for festivals like deepavali, Krishnashtami and more.. Enjoy as evening snack with cup of coffee or tea or along with bisibelebath or any other rice dishes,. Sweets are always a traditional part of our festival meal. 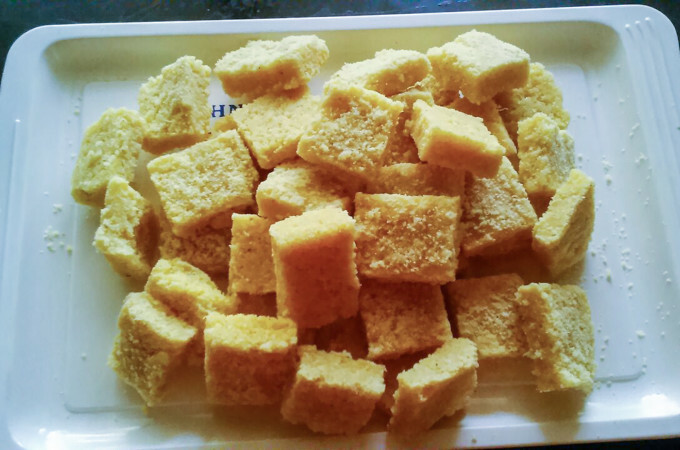 One of the most popular sweets are burfi/barfi .The flavor of a barfi is often enhanced with fruits or nuts. The base ingredient can be coconut, besan/gram flour or even with milk khoya Coconut burfi is most popular and flavorful burfi. For krishna Jayanthi, DeepavaLI/diwali and for navarathri festivals we do prepare these burfi. Here I have a very tasty Pineapple – coconut burfi recipe for upcoming Navarathri Golu and Deepavali/Diwali festival.